We wanted an elegant, festive and rich meal. But we wanted to eat it informally. And with some of our crew away on holidays, we were hobbled a bit in the kitchen… So what could be served that was relatively easy yet appropriate for the occasion, a holiday get-together with some very good friends? I made a simple smoked salmon and dill spread that was served with toast. Mrs. MM made a FABULOUS shrimp bisque, a properly thickened shellfish soup, redolent with shrimp essence. Flavored with a touch of cognac, it would be perfect for cold weather, but was utterly delicious with the airconditioning turned on instead. A typical plate that evening at dinner. Roast Beef, haricots verts (beans), pan roasted carrots, a portabello mushroom saute, popover, gravy and for dessert, apple pie a la mode. Delicious! Wow! That meal is just perfect, enough said. Never attempted popovers but have thought about buying he pans a few times to try it out. Is it difficult? They seem intimidating to make. Happy Holidays to you, Mrs. Marketman and The Kid! Hello MM: Sometimes the simplest things turn out to be the best. 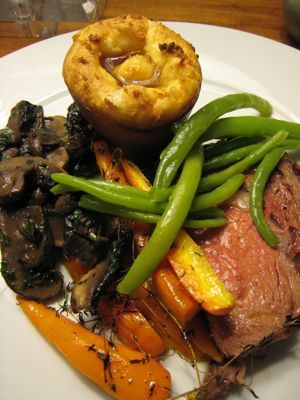 Your roast beef dinner looks absolutely delicious! Alicia…If you have muffin pans at home, those would do. It is also one of the simplest and easy things to make. All it is consists of EQUAL PROPORTIONS OF EGGS, MILK, and ALL-PURPOSE FLOUR with salt and pepper to taste. So it doesn’t matter whether you use small or large eggs. The trick so they will rise….REALLY RISE is to have your mixture ICY COLD to begin with. So what I do is put let’s say 1 cup. eggs, 1 cup milk and 1 cup flour in a blender or even use a whisk . Strain to remove lumps. I do this in the morning if I want to make this for supper. So refrigerate your batter until ready to use. So, after you’ve cooked your roast beef, tent it with foil, crank up your oven to 400 to 425 degrees (standard oven). Pour about 1 tsp. oil in each muffin hole. Then put your muffin tin on a cookie sheet (to catch any oil that will drip later on so you will not activate the SMOKE ALARM!…)Put inside oven and heat till it’s SMOKING HOT! This won’t take long…Pour your icy cold batter in a measuring cup, remove muffin tins from oven and gently pour batter into muffin tins filling only 3/4 full. Put back in oven, lower heat to 375. IMPORTANT: DO NOT OPEN OR PEEK inside oven for 30 to 45 minutes. If you open oven door before then, your yorkshires will deflate. You will end up with a HOCKEY PUCK! I have done yorkshire pudding this way for 20 something years now and so far, so good…no hockey pucks yet!!! I’m sure it was a spectacular meal. Really looks yummy. Simple and elegant-looking, and to me, very “English” (the roast beef and the yorkshire pudding}. 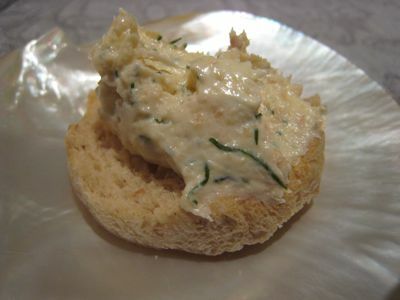 Did you add cream cheese or cheese sauce to your salmon and dill spread? The first photo looks creamy. I usually just serve smoked salmon with lemon and onions. After seeing your photo, I’ll try serving it with a cheese sauce and see what it tastes like. betty q: thanks for sharing your secrets for popovers. I wonder whether they’ll work for eclairs? Perhaps not, as the baking tray would be so hot. Merry Christmas and another blessed year ahead for you and your family! That looks fantastic! What a feast! Merry Christmas to you and your loved ones, MM! Wow! Darn! Lovely dinner indeed! MM – whatchatink about this idea? What about say raffling off some slots for an exclusive “Chef MM” dinner! While I am certain that your culinary skills assure your guests of a good dinner, I feel that the love and thought you put in the preparation are what makes for the perfect seasoning! The taste travels from good to great! Erlinda…Eclairs and cream puffs are made with what we call CHOUX PASTE. It is an entirely different ball game!…But with choux paste, I usually make something what we call CROQUEMBOUCHE …baby cream puffs built into like a Christmas tree!…Anyway, here is the recipe: In a saucepan, put 1 cup water, 1/2 cup butter and pinch of salt. Heat to BOILING and then add 1 cup all purpose flour. Lower your heat and keep on stirring until it leaves the sides of the pot for about 2 minutes more. You will have a REALLY THICK MIXTURE! Remove from heat and transfer your paste into a mixing bowl. NOW…start your mixer and beat the mixture on medium speed for a few minutes. Start adding eggs ONE AT A TIME. I found thru trial and error over the years it would take between 3 to 4 eggs total depending on the size of your eggs. End product should be smooth and not too runny. It is better to err on the side of LESS than MORE. Just by looking, I can tell if I have added enough eggs. To test it, get a spoon or put mixture in piping bag. Pipe or plop a walnut size ball on a parchment lined cookie sheet. IF IT HOLDS ITS SHAPE without sreading too much, then your cream puffs will turn out good! Space them 2 inches apart.Bake in preheated oven. 375 degrees for about 30 minutes then lower heat to 350. Bake until nicely browned about 15 to 2o minutes more. I would really appreaciate if you could also share your recipe for pancit malabon, if MM wouldn’t mind , of course. 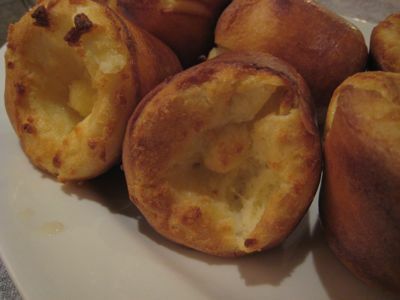 Betty Q: THANK YOU for sharing your recipe for popovers! I don’t seem to get this right but with your very clear and precise instructions, it does appear easy (as pie) and am challenged to do so. betty q: Thanks for your cream puff recipe. I’ll try making chocolate eclairs again this christmas holidays. The last time I tried a cream puff recipe (one I found in a cookbook), my “drops” did not “puff” – they came out rather flat looking. I had no trouble with the first part of the recipe (butter, hot water, flour, etc), but when I added the eggs, the mixture got kind of “liquidy”. I remember that the recipe I used called for 4 large eggs; so,of course, I used 4 large eggs. But the dough was somewhat”runny”, and my cream puffs turned out like “raised” cookies, which was quite a disappointment. They were OK (rather sweet), but nothing like what I buy from the bakery. I tried the recipe twice, and failed both times. Since then, I’ve collected a number of cream puff recipes(even Martha Stewart’s) because I really would like to learn how to do this thing properly. With your receipe, I may yet succeed. You wrote something really important: the “blobs” should hold their shapes. From what you wrote, the secret for this may be the number of eggs. I will have to watch the eggs next time, and will use only the number that, by sight (per your tip), would lead to a dough that looks sticky enough for the “drops” to hold their volume and shape. Why use 4 eggs when 3 would do? Once again, many thanks, betty q, and to you, as well, MM, for allowing us to exchange info in your blog. Thanks bettyq for your recipe and technique! You make it sound simple enough for me to try. I will try these out soon and let you know! Hi Erlinda…All I can say is I am not sure if there is a worldwide standard of calibrating eggs. What may be classified as large here may very well be considered EXTRA LARGE elsewhere. Here’s what I can do for you…after I have finished making mango pudding and baking my pies for tom. I shall make a batch of eclairs and WEIGH the total number of eggs I shall use. Would that make it easier for you? Send me an e-mail…bettytrinidad@hotmail.com…so we are not hogging MM’s blog…so sorry, MM! Hello MM, WOuld Mrs. M mind very much sharing her shrimp bisque recipe? Hello. Where did you buy your prime rib? Happy Holidays! MM, MERRY CHRISTMAS TO YOU AND YOUR FAMILY!!!! MERRY CHRISTMAS TO ALL MY FELLOW FOODIES!!!! May the coming year bring PEACE, GOOD HEALTH, GOOD FORTUNE and continued success in all your endeavors! Irma and dee bee:…I will more than happy to share the Pancit Malabon recipe…just send me an e-mail. It is really a long one. I have sent the recipe by e-mail to MM (I think last week…maybe it went into his spam folder!!!!). If I may ask a favour, Please do try it and let me know what you think. I am just relying on my childhood memory of its taste when my brother-in-law (who was then courting my sister)brought us 1 bilao of Pancit Malabon. Happy holidays everyone! Hi bettyq! Would you be so kind as to share your pansit malabon recipe with me as well? My email is samut_sari@yahoo.com. Thank you and I do appreciate your tips and recipes you share with MM and his readers. merry christmas, marketman!!! can i ask for mrs MM’s shrimp bisque recipe? it looks so yummy!! Merry Christmas to MM and family and all marketmanila fans. Yes! 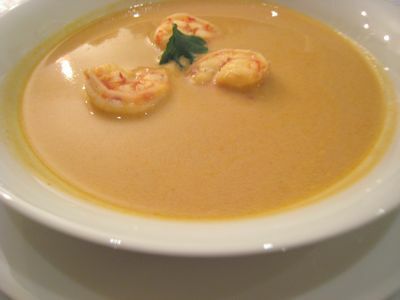 Please share recipe for shrimp bisque. I so love soup. I made fresh mushroom soup for christmas eve dinner and it was extremely good despite the effort I have to put in. betty q you are one of the best and as usual your relentless sharing of your recipes and tips are greatly appreciated. hi betty q! I know MM wouldn’t mind the exchange of ideas in his blog…can you also send me your recipe for Pancit malabon? erleen_16@yahoo.com. Hi again, Erlinda…just made a batch of profiteroles(baby cream puffs). I used 3 extra large eggs (only had extra large eggs in the refrigerator) weighing 5 1/2 oz. total. They turned out just great…Here’s a tip: when you bake COOKIES, or practically anything EXCEPT CAKES bake them at the UPPER THIRD of your standard oven. I have 5 slots in my oven for the racks…so I put 1 rack on the 2nd slotand that’s where I bake my cookies, even ENSAYMADAS or PAN DE SAL! The bottom of the bread isn’t dark (turns just the right LIGHT BROWN COLOR). Let me know how your eclairs turn out. Also, did you wonder how the bakery gets the filling inside the cream puff without splitting it in half? We usually poke a hole in the bottom wide enough to squirt the custard using a plain tip about 1/2 inch in diameter inside a piping bag. Oh…you can freeze your eclairs or profiteroles (no filling yet) if you make a whole kaboodle! Touche…to simple is better, especially on hectic occasions like Christmas….simple will always stand out. The popovers look super…and I do love doughy ones…perfect with huge pats of reallyyyyyyyyyyyyyyy good butter. My sis in law brought back a box of CALPIS butter from Tokyo (yes really good Japanese butter!) that would probably be perfect with your popovers. A Christmas full of memorable things amidst the sea of what usually comes our way during the season…and to fellow foodies, here’s to a 2008 full of even more to celebrate and savor! Thanks MM, for a great venue to discover more of what’s good about this world of ours….all the best to Mrs MM and the Kid!!!! Only if you can visit our home one day and prepare a meal for us…hahaha :o Oh how that bisque looks extremely delicious. Your roast beef and sidings are just my favorites. And your salmon and dill spread? These things are what I consider a fabulous meal. Deceptively simple Christmas dinner. But it is fabulous! I say it is simple only because of the relatively easy way of preparation. You can afford to be simple only if you have the freshest, best ingredients to work with. By the looks of it, the roast beef was done to perfection. Cheers!